LTE-M1 is the 3GPP’s long awaited answer to growing interest in the Internet of Things community to low power, long range networks (LPWAN). LTE-M1 allows simpler and less expensive radio chipsets to connect to existing LTE networks, after a software upgrade. There are two primary innovations that make LTE-M1 a very attractive option for designers looking for extremely power efficient performance, along with the ubiquity of already deployed LTE networks. This article will briefly describe how eDRX and PSM work, and why it greatly improves the battery life for LTE-M1 connected devices. For applications like water meters, agricultural monitors, and cold chain monitors, this is a game changing technology. A normal LTE paging cycle is 1.28s, during which the device can be contacted by the network if traffic is queued for that UE (User Equipment - LTE lingo for the “thing” connected to the network). The not-yet-implemented LTE DRX improvement to LTE allowed UE devices to sleep for 10.24s between paging cycle which improved sleep current somewhat, but still not enough for multi-year battery life. LTE-M1 also extends the normal idle to 5.12s from 1.28s. 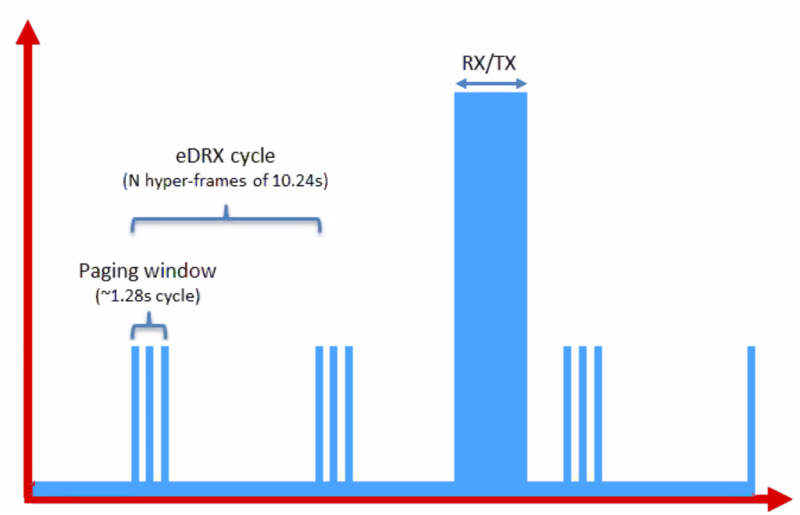 The eDRX innovation allows the UE to tell the network how many “hyper frames” (HF) of 10.24s it would like to sleep before checking back in. The maximum number of HFs a UE can sleep is settable by the mobile network operator, but it should be at least 40 minutes. For a LTE-M1 device that transmits data once per day, and wakes up every 60 hyper frames to check for commands (this would be about every 10 minutes), a life of 4.7 years is achievable on 2 AA batteries. Power Saving Mode is a mode that the UE tells the network it is going to go dormant indefinitely. When the UE host device decides, based on some logic or timer, that it is time to transmit, it wakes up and transmits to the network, and remains in RX mode for 4 idle frames so that it can be reachable if needed. Power Profile for LTE-M1 Power Saving Mode. 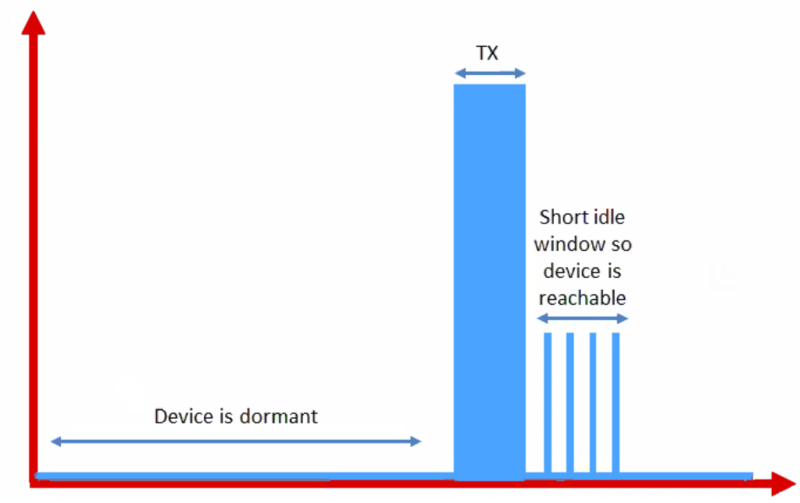 Since the device is dormant during the the entire LTE PSM window, it’s power consumption is extremely low. In fact, it can be even lower than a Sigfox or LoRaWAN module, since the TX rate for LTE-M1 is much higher (do to the lack of interference in the licensed spectrum). An LTE-M1 devices that transmits once per day in full PSM mode could last well over 10 years on 2 AA batteries. Verizon and Sequans are accelerating development of LTE-M1 for the US market. If you have more questions, reach out to us or tweet us @LinkLabsInc.